One of the many good things about birding is to always expect the unexpected, and today something happened that was very unexpected indeed. I was busy at work during the day, and it seemed like any ordinary day as I made my way around Milton Keynes doing my deliveries. Then I popped into a customer and when I came back I checked my phone to be greeted with texts, missed calls, voicemails and tweets - a juvenile Woodchat Shrike had turned up at Harrington Airfield!! I hurried around my route while arranging to meet Jon and Kirsty for the after work twitch. I knew one hadn't been seen in the county for a long time but I wasn't quite sure how long it had been. After work I got to Jon's house as quickly as I could during the rush hour traffic and soon we were on the way to the airfield. We parked up and made our way to area the bird had been frequenting and soon found ourselves at the 1st bunker with a bizarre "marie celeste" atmosphere about the place. Scopes were littered around with no one seeming to be present, strange I thought! As I made my way around the concrete bunker I suddenly found out why as a group of birders were huddled up in a hole with lenses facing in the same direction. Mark Williams was amongst them and when he saw me approach he pointed in the direction the bird was in. I looked around but couldn't see it and when I looked back at Mark he was still pointing but a bit more dramatically this time. I suddenly realised he wasn't pointing passed the small bush right infront of him but he was pointing at the bush! 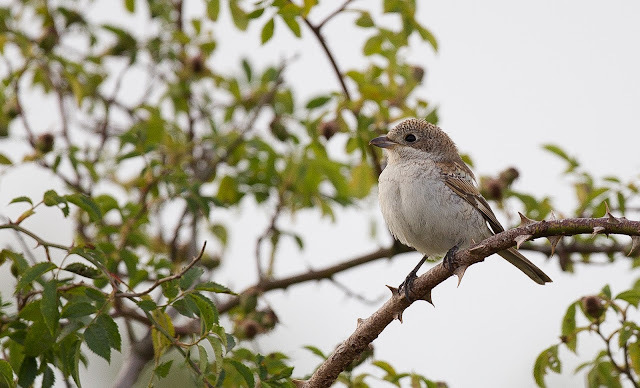 The Woodchat Shrike was sat on top of a bush only about 10 feet away. This was a relief as I know from personal experience just how hard birding this site can be, birds seem to just "evaporate" here so to get it straight away was a bonus. 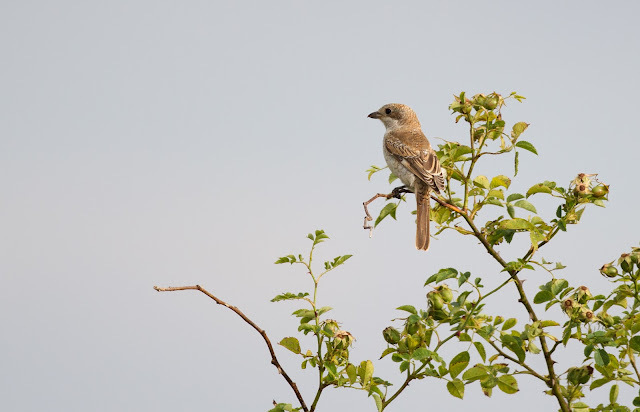 We watched the Shrike for a while before it flew up and over our heads and landed in the top of a tree before zipping around the corner. Birders were now obviously finishing work as a steady stream of people could be seen heading through the trees and soon there was a fairly sizeable group. It took a while to refind but luckily someone saw it at the bottom of a small tree and then it came back up to the top again and carried on feeding putting on a real show. 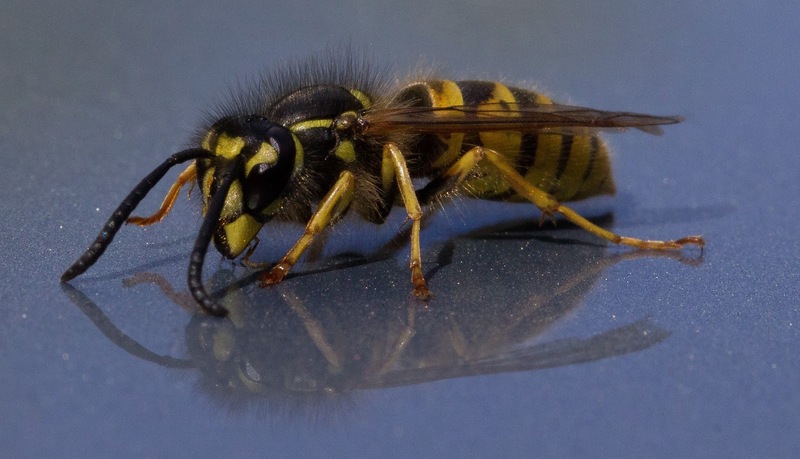 It even flew up and caught insect right above my head! 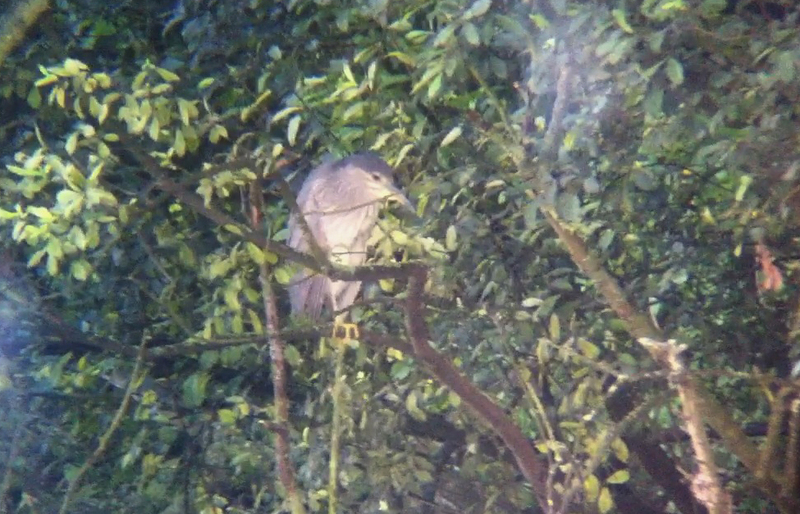 I managed to get a few phonescoped pictures as it perched up probably wondering what we were all looking at. And then Jon very nicely allowed me to use his 500mm prime to get some pics. What a fantastic looking bird?! 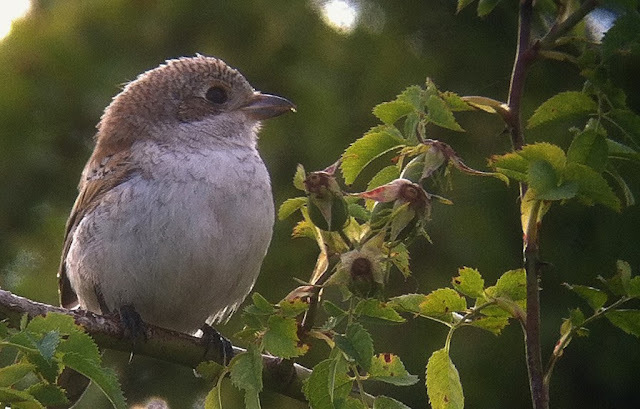 After getting our fill of this little cracker we decided to head to the pub for a celebration pint and while we were having a glass of beer in the beer garden I sent out a few texts to find out just how long it had been since the last Northants Woodchat Shrike sighting. Mike Alibone and Bob Bullock both text back to say that only two had been reported previously, quite staggeringly one in 1883 and an older record from 1869. I nearly fell off my chair when I saw this! We had just seen the first Woodchat in 130 years! I knew that they must have been reported by Lord Lilford's book "Notes on the birds of Northamptonshire" which was published in 1895. 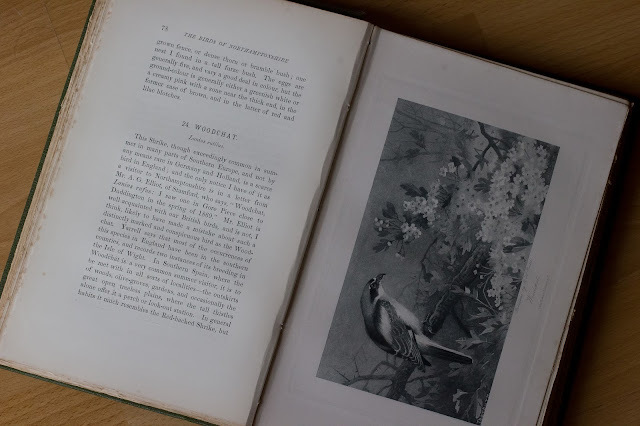 I am lucky enough to own an original copy of this two volume set and it makes for very interesting reading, in fact I may one day include a post on this blog with extracts from it as it shows the many differences in bird populations and mans attitudes towards birds in the past. The entry for the Woodchat records both the previous sightings. The bird seen in 1869 was found near the village of Duddinton and the later one of 1883 was just outside Stamford (according to Lord Lilford it was just inside the Northants border) when a dead bird was picked up on the 9th of January. The bird was partly decomposed but it records it as a female bird with slightly soiled plumage, and showed signs of a bird that was "picked up in a long frost". 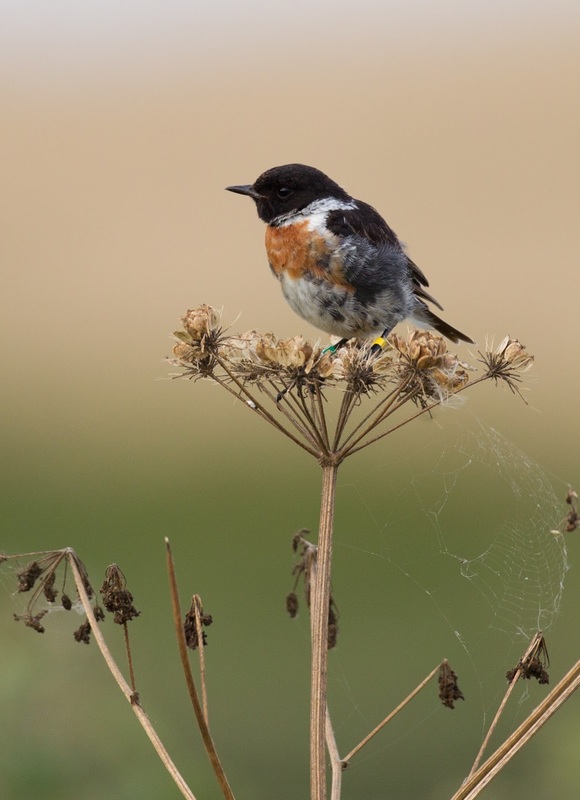 Due to these reason the 1883 bird is in dispute but nevertheless it means the present bird is the first one recorded in 130 years! And the first one recorded as being seen alive for 144 years! Amazing statistics showing just how good a county bird this is. It had been feeding all day and the clear sky and large moon did make a few of us comment that it probably won't be there in the morning but we did of course keep our fingers crossed but unfortunately it didn't work and there were no sightings of the bird following day. It was one those evenings that I think a few of us will have fond memories of for quite a while, and to add a special note to the evening this was Jon and Kirsty's first ever Shrike sighting and what a sighting it was! 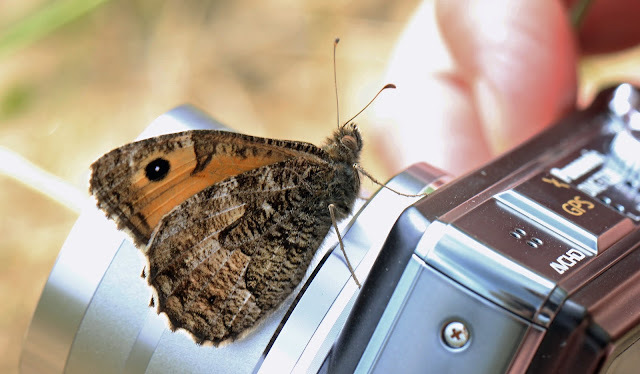 The original plan for the weekend of the 11th of August was to head to a site near Reading in the hope that we could see some of the Grayling butterflies there. The plans changed rather quickly though when a Roller appeared on the east coast of Norfolk and hung around for a few days and as you can see Grayling there too we decided to head there instead. We (Jon and Kirsty Philpot, John Friendship-Taylor and me) had arrived in Horsey mid morning and were comforted by the news that the bird was still showing well near the end of the Nelsons Head track. It took a little longer to get to the end of the track though due to the wealth of insect life that was in the area. We were staggered by the amount of butterflies and dragonflies all over the place with Purple Hairtreaks flying around in the Oak trees by the side of the road and dragonflies hawking constantly above our heads. Walking along the track found lots of Silver Y moths, Common Blues, Small, Large and Green Veined Whites and a Buddleia bush almost hanging with the weight of Peacock butterflies and Bees nectaring off it. As soon as we got down to the dunes masses of butterflies could be seen flying amongst the grasses with Dark Green Fritillaries being instantly apparent. Some of them looked remarkably fresh considering they should be reaching the end of their flight time. 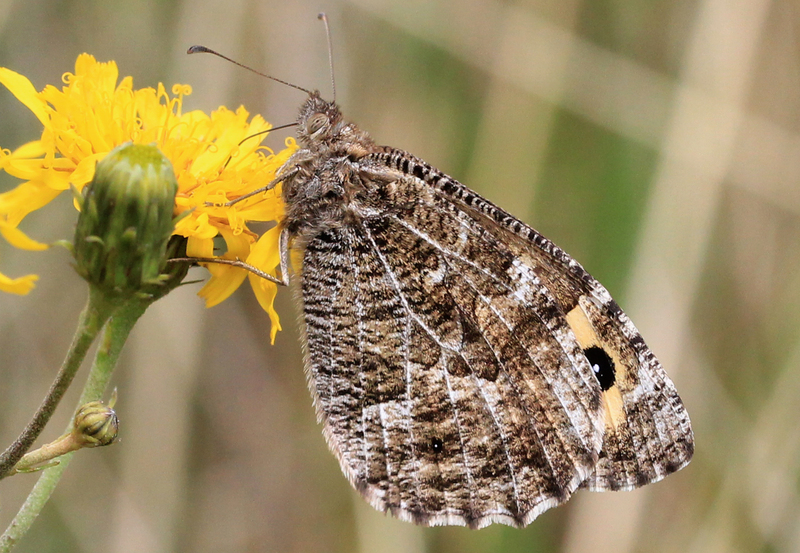 As I searched the area eventually I saw a different looking butterfly further up the dune and a closer look showed it to be a Grayling nectaring on a flower. This was proving to be a good morning as both the target species were seen almost as soon as we had got there and they were both new species for me too. Eventually we reached all the other twitchers and we got good scope views of the Roller as it busily flew from fence post to fence post while it fed. Unfortunately it was too distant for a decent pic but I did manage a passable record shot digiscoping with the phones camera. It turns out another butterfly lifer had whizzed past without me noticing as after a chat with couple of lads I had met earlier in the year at Fermyn Woods looking for Purple Emperor (it's amazing how you constantly bump into like minded people you recognise all over the country) it turned out a Clouded Yellow had shot past just before I had arrived. After getting our fill of the Roller we started to explore more of the area. 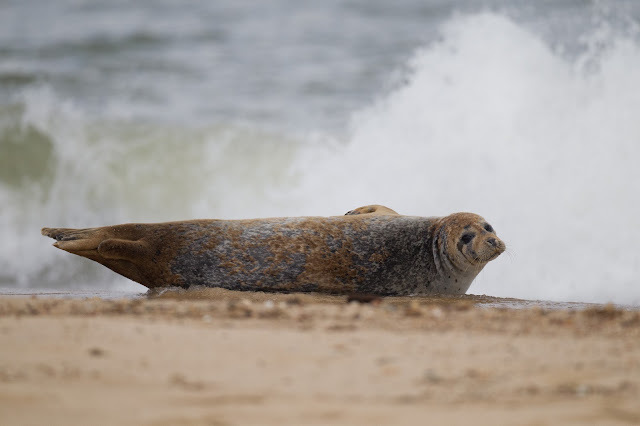 Lots Grey Seals were relaxing on the beach on the other side of the dunes and were putting on quite a show as they rolled around scratching themselves and making some very strange noises in the process. 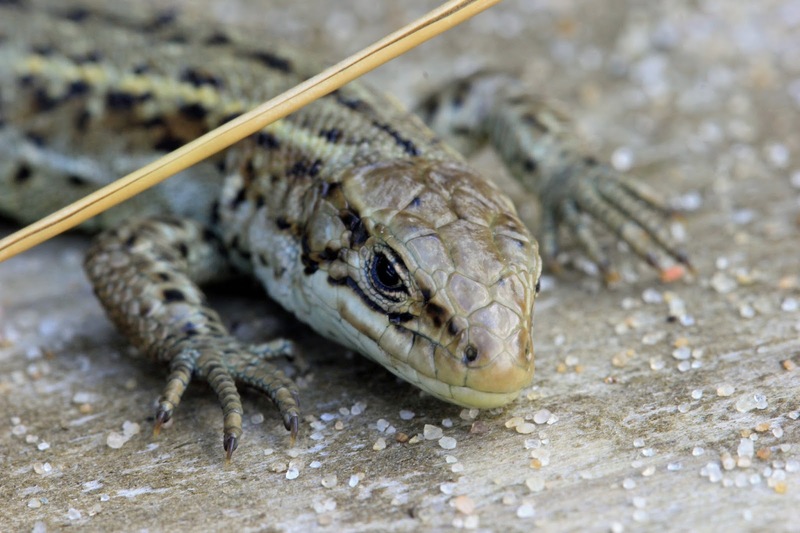 A Common Lizard was basking in the sun on the steps up the dunes and certainly didn't seem to mind me taking it picture as it let me get very close. As I climbed the stairs a Painted Lady was flying among the grasses and on the top of the dunes more Graylings could be seen and they didn't seem to be shy with one resting on my boot and another landing on John Friendship-Taylor's camera! 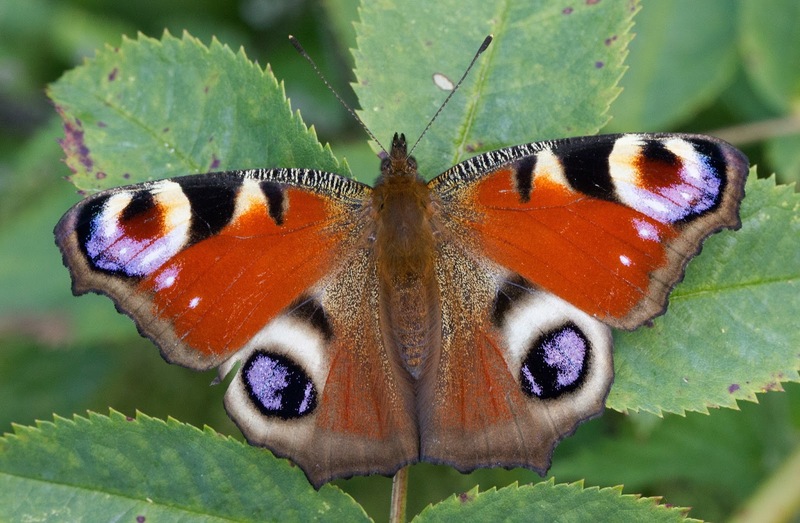 We slowly walked back along the track adding a Wall butterfly to the daylist along the way and after having quick pint in the Nelsons Head pub we walked back to the car. 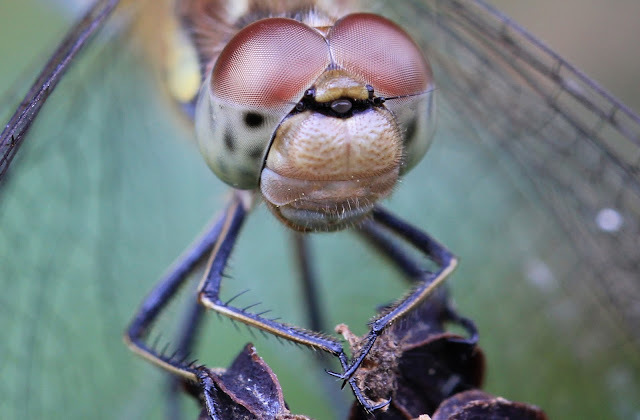 A very confided Common Darter just up the track from the pub allowed me to take a close up of it before it finally shot off. We headed to How Hill reserve after this as a second generation Swallowtail Butterfly had been seen a few days previous but despite a good search we couldn't find one. So we left here and headed to Cley to see the Red Necked Phalarope that had been reported and luckily a few people were already in the hide looking at it so we had it pointed out to us pretty quickly. By now the clouds were rolling in casting a bit of a chill on an otherwise beautiful sunny day. 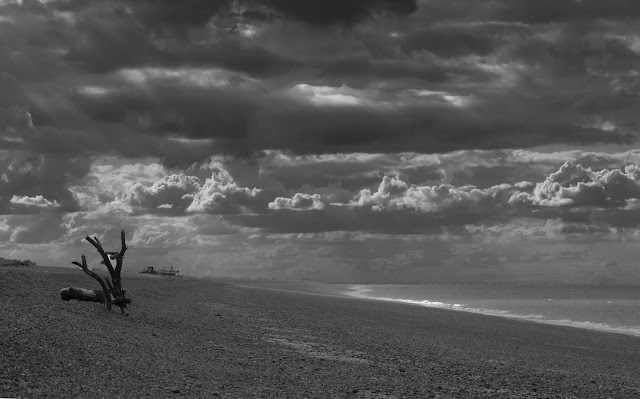 I took the opportunity to take a landscape pic on the beach as the sky looked pretty dramatic. We then popped to Kelling Water Meadows to see the Wood Sandpipers and once again the sun came out casting a very nice light on the area. 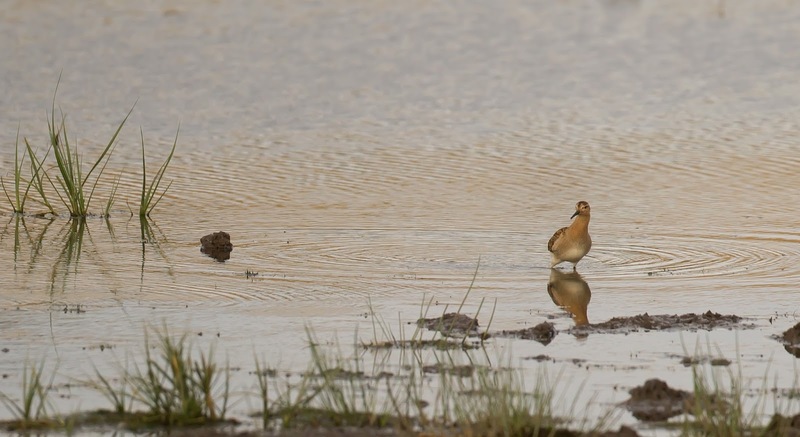 We saw the Wood Sands after a bit of searching and we spent a while admiring the local waders with some very nice looking Black Tailed Godwits, Greenshanks and Ruff. A local Stonechat provided a bit of entertainment too as Jon very kindly allowed me to take some shots with his 500mm prime lens. We then spent the rest of the evening at a good birding friend of mines house for a BBQ and a beer, and a very nice evening we had too! So many thanks to Kieran and Leila for their hospitality! The following Sunday (the 18th) I finally caught up with Clouded Yellows. During the previous week a mini invasion had obviously begun but as I was at work I couldn't get out to find them. Reading the reports of them being seen all over the place made it my mission to see one at the weekend. 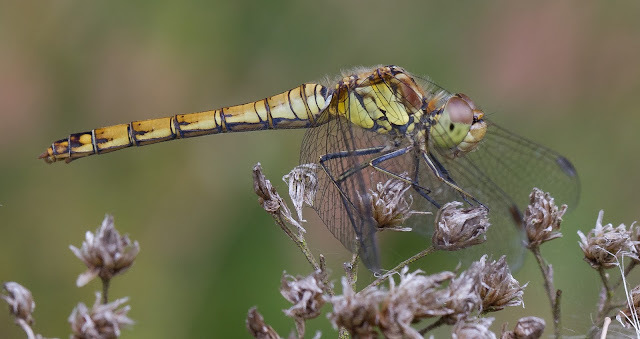 I had heard from a friend on Facebook that two had been seen at Twywell Hills and Dales the previous Friday so I headed there first thing in the morning but after searching for over three hours I couldn't find one and that depressing "sinking feeling" started to set in. I had managed to get some pics of the other local butterflies so it wasn't a complete waste of time. I was starting to think of giving up but luckily a mate of mine Sam Candy rang to find out where I was and he came over to join me. This fortunately gave me an added boost of enthusiasm and we decided to head over to another site up near Peterborough were they had been reported a couple of days previous. Having never been there before we had to use the Ordnance Survey map to find it and soon we were wandering along a track looking out once again for Clouded Yellows. Lots of Common Blues were about too and Common Darters were resting on the fence posts A nice looking Brown Argus also gave prolonged views as it basked in the sun. 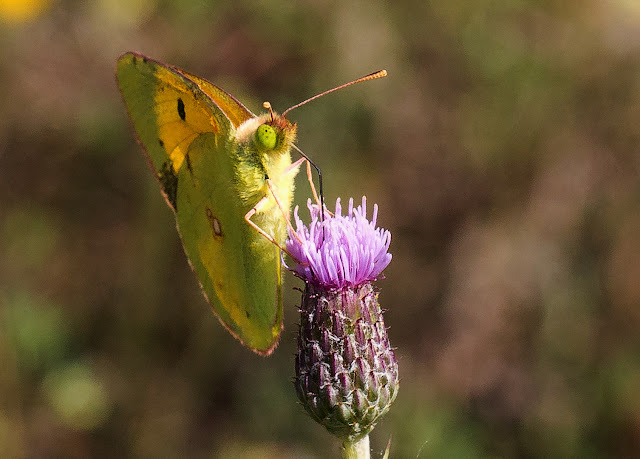 Eventually as we walked further along (dodging the Trials bikes which sometimes got dangerously close) I looked along the ditch and a mustard coloured butterfly shot through at quite a speed before tuning around and heading back. At last I had finally seen my first Clouded Yellow! This was my 40th butterfly species of the year which I don't think is too bad as with the exception of Norfolk we hadn't traveled too far in the search for them. We walked along the path and found some Buddleia bushes dripping in Peacocks and Red Admirals before looking back and seeing a chap standing in the area the Clouded Yellow was in with a camera so we headed over to join him. 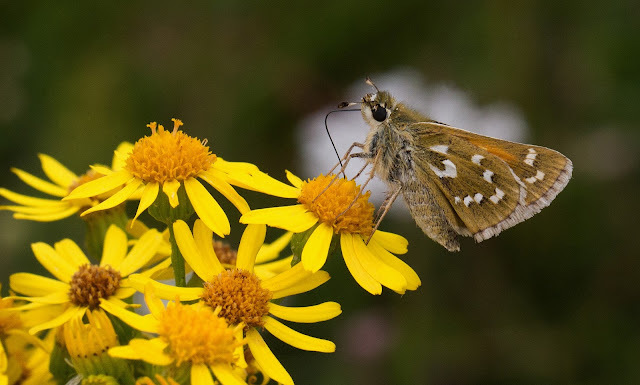 We found ourselves in an area carpeted with Trefoil flowers and the sight of at least three Clouded Yellow butterflies whirling around. They certainly took some patience to photograph as they were very skittish and hard to approach but after a bit of perseverance I finally got some shots I was happy with. We walked back towards the car, once again dodging the trials bikes that had now been joined by quad bikes kicking up even more dirt (slightly ironically they were using a "No Motorcycles" sign as a cornering post), and we remarked on just how well the day had finally turned out. We had the customary beer on the way home too. 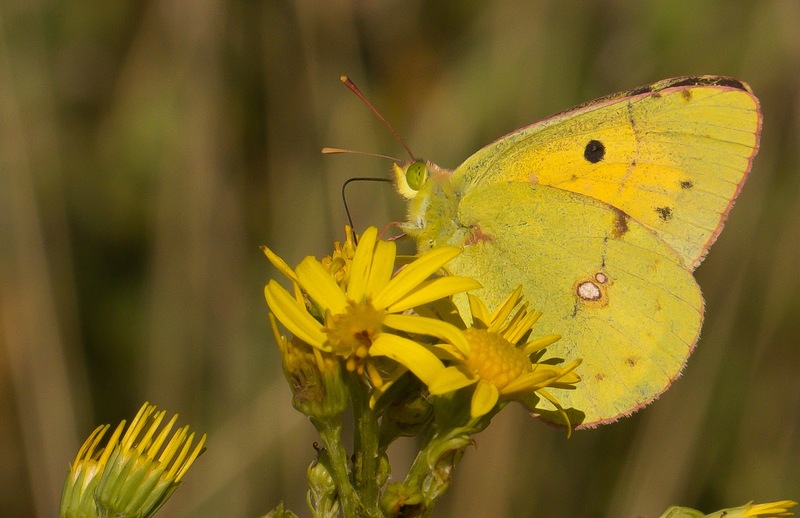 Many thanks also the local chap who we met at the Clouded Yellows, I am afraid I cannot remember his name but if you are reading this then thanks for your help. The Sunday of the 4th of August was a very good day for me as nearly everything went right. It very often doesn't happen like that in wildlife watching as there are far too many variables (which is of course what makes it exciting) but today it all slotted into place. 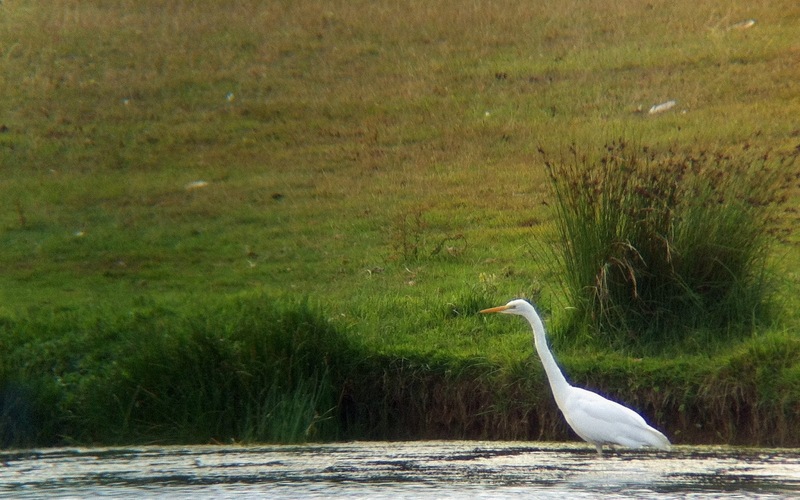 The week previous to this is worth mentioning as I once again saw the Great White Egret at Clifford Hill and also twitched a lifer in the shape of a Night Heron up at Thornton Reservoir in Leicestershire but could only manage a record shot of them both. The combination of bad weather and working meant that the next opportunity to get out was the Sunday which was, as luck would have it, a day when the rest of "the gang" could make it too. So after various text conversations we decided to head back down to Oxfordshire to see if we could see some of the local butterfly specialities. Sam Candy came and picked me up first thing and then we picked everyone else up enroute and at about 09.30am Sam Candy, Jon and Kirsty Philpot, John Friendship-Taylor and me were starting to explore Aston Rowant NNR just off the M40. 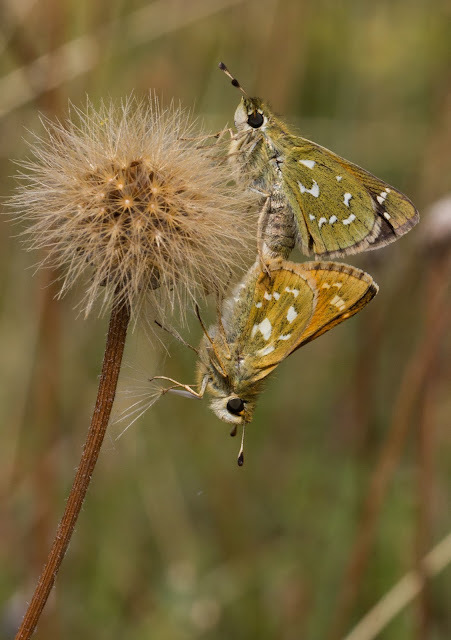 The targets here were Silver Spotted Skippers, Chalkhill Blues and Dark Green Fritillary. 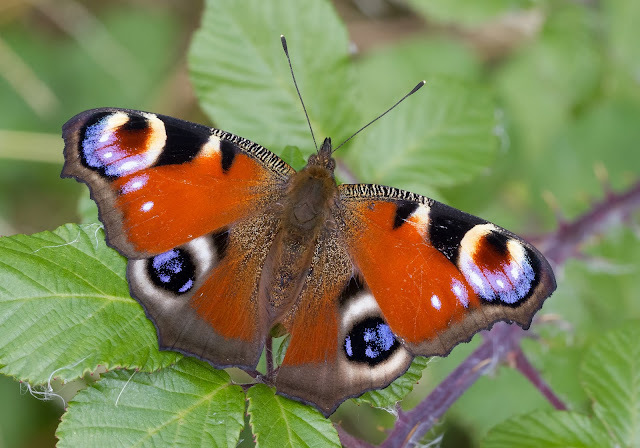 The weather looked almost perfect for butterfly photography too as it was warm with sunny spells but the wind did prove to be a bit of a pain. As we walked out of the woodland and onto the chalk grasslands we started looking straight away. 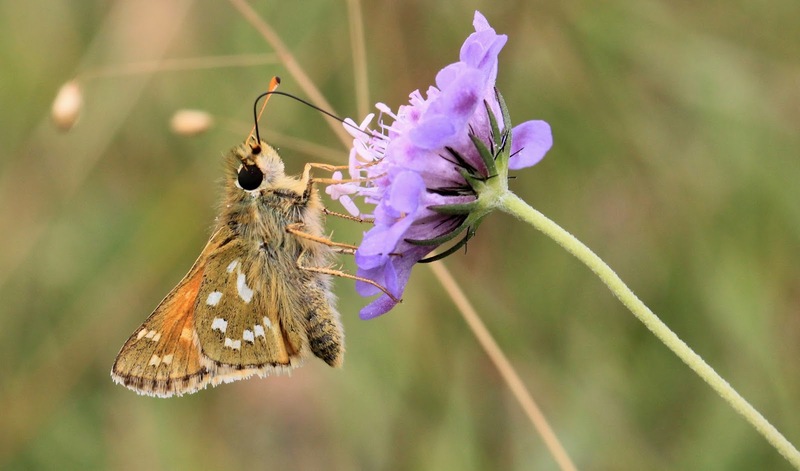 Even though this is one of the best sites for Silver Spotted Skipper and Chalkhill Blue none of us had been here before to see the butterflies so we had no idea how hard it would be. 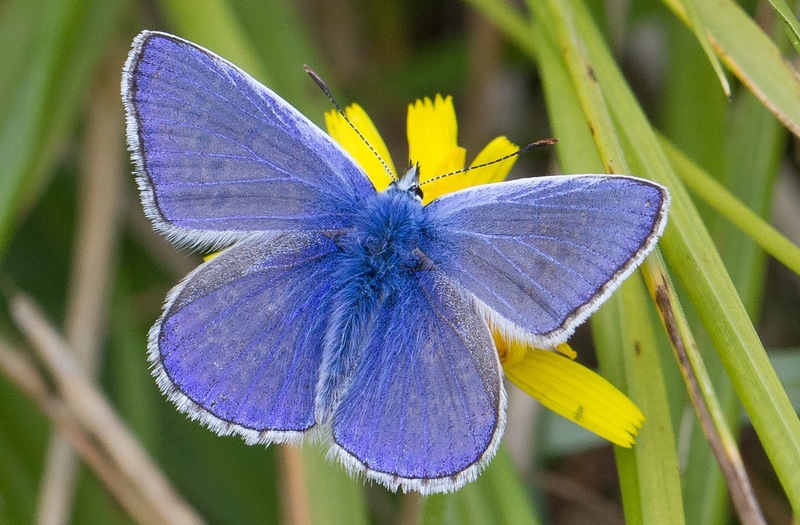 Jon very quickly spotted a Chalkhill Blue which we all took pics of before Kirsty then spotted the first Silver Spotted Skipper of the day. Great! We had all connected very quickly so then it became the quest for photographs. 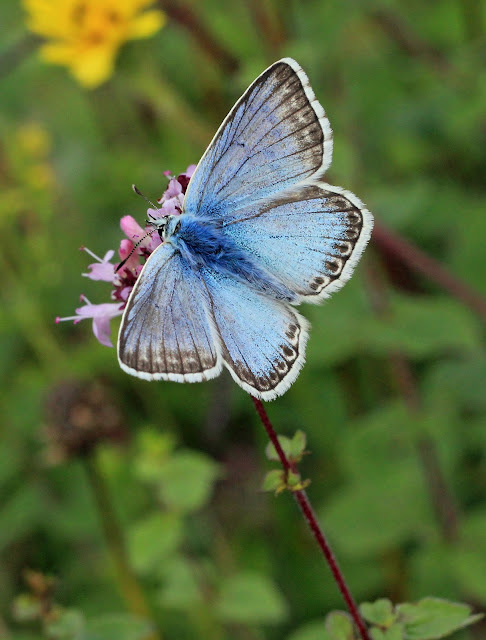 We explored the grasslands seeing more and more Chalkhill Blues with the odd Silver Spotted Skipper thrown in. 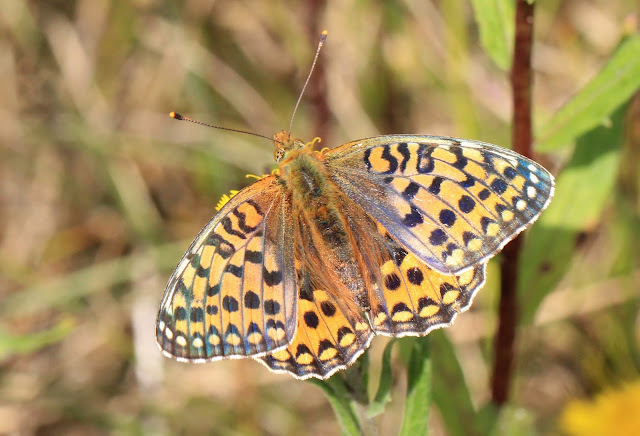 Then we spotted a Fritillary feeding along the hedge but as it turned on the flower it was nectaring on it showed itself to be a Silver Washed and not the Dark Green we were looking for. 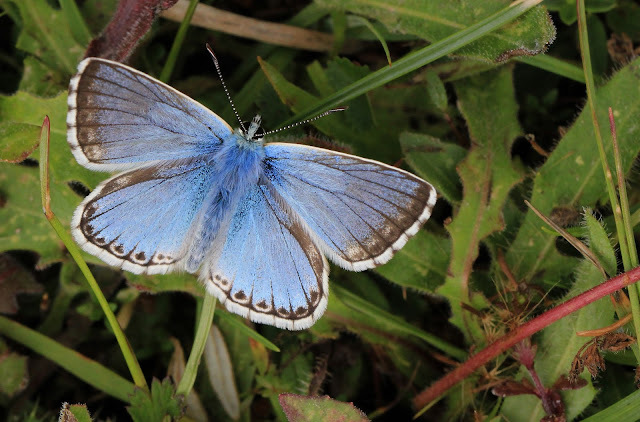 As we walked around the corner my mouth fell ever so slightly open as I was greeted to the sight of a cloud of Chalkhill Blues flying over the grasses, and to add to it this more sheltered area provided lots of Silver Spotted Skipper with a few Brown Argus thrown in too. We made our way along the hillside seeing more and more with a few day flying Silver Y moths also added into the mix. Jon then picked out the best photo opportunity of the morning with a pair of Silver Spotted Skippers mating on an old Dandelion stem. We all had a go taking pictures of these with people huddling up to try (and failing) to block the wind for others as they took shots. 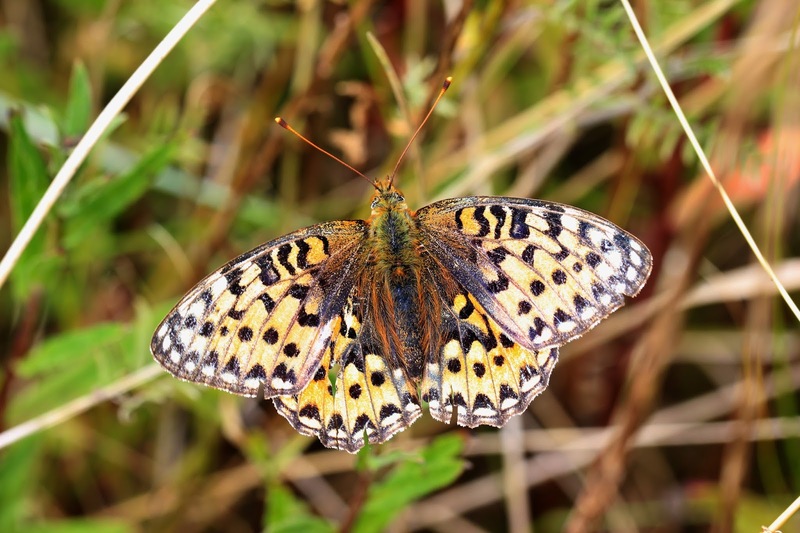 Still in search of a Dark Green Fritillary we ventured into the next field and straight away saw some Marbled Whites and we then turned and walked up to the top of the hill to admire the view. A very nice view of the Oxfordshire countryside it was too with the exception of the M40 cutting through the middle of it. We explored the top of the hill and then made our way back to the car, we were never really holding our breathe for Dark Green Fritillary anyway so we wasn't too disappointed that we didn't see them and the spectacle of this place at this time of year more than made up for that. We had a spot of lunch by the car and then we drove to Otmoor RSPB as Sam wanted better views of Turtle Dove. We did have an ulterior motive for visiting this site again as the week previous the reserve warden has mentioned it is a good site for Brown Hairstreak and according to the reports on the Upper Thames Branch of Butterfly Conservation website one had been seen at a different site a few days before. 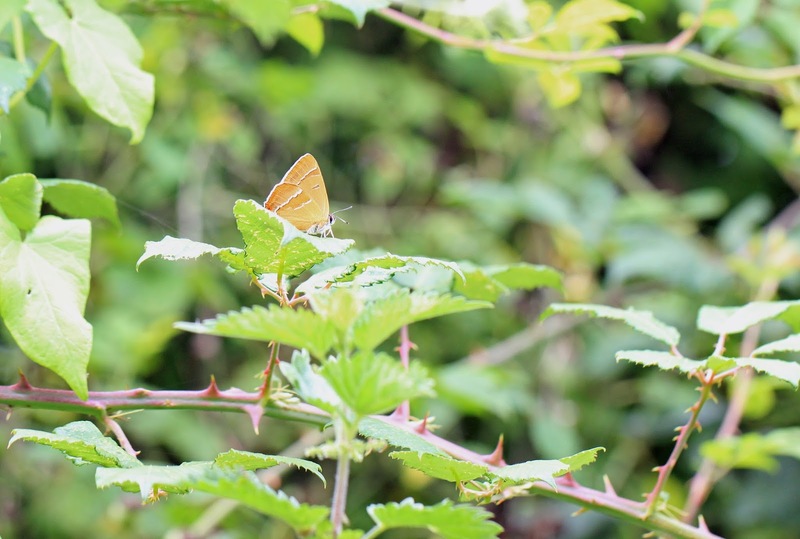 We decided to chance it despite the weather that had now really taken a turn for the worse with dark clouds, outbreaks of rain and an ever growing wind reducing our chances of seeing any butterflies (let alone one so elusive as the Brown Hairstreak) into a very slim one indeed. We followed the "Roman Road" section of path from the car park trying to tread carefully to miss the baby Frogs that were hopping around all over the place. Quite a few Meadow Browns were present along with a few Ringlets and Green Veined Whites. As we walked along Sam suddenly exclaimed "whats that little brown butterfly?" and as I looked up a small butterfly flew above my head and landed on the bush just above me. I genuinely couldn't believe my eyes! Right in front of me was a pristine Brown Hairstreak sitting on a leaf. According to my friends my reaction was a little bit excitable to say the least as I shouted to try and get the rest of the group on it while trying to get pics myself. Shortly after it took off and we held our breathe to see where it would go, luckily for us it flew onto the flowers even closer and posed long enough to get some good close ups. I was absolutely buzzing after this! This was my last Hairstreak for Britain and I cannot help thinking I had involuntarily left the best until last, what a stunning looking insect? 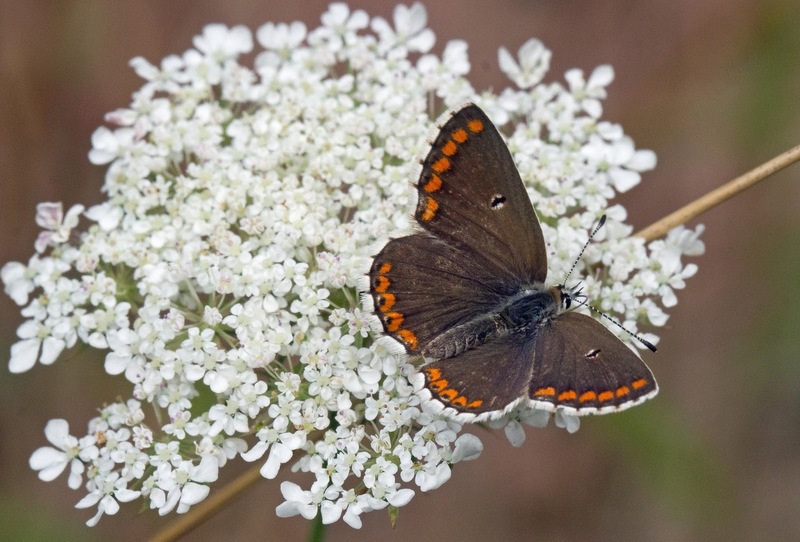 In fact I had a sudden realisation that I had seen them all this year as along with this Brown Hairstreak I have seen Green Hairstreak at Twywell Hills and Dales, Black Hairstreak at Glapthorn Cow Pastures, and White Letter and Purple Hairstreak at Fermyn Woods. 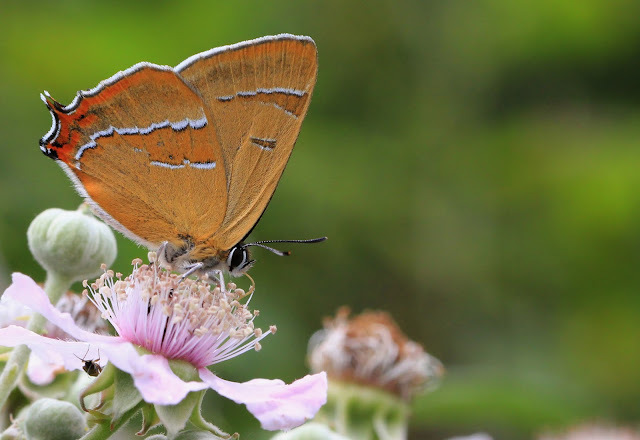 Brown Hairstreak, RSPB Otmoor, Oxon. Remember when I said at the beginning of this post that "nearly everything went right"? Well this is the bit that didn't, unfortunately we couldn't find the Turtle Doves for Sam. Never mind it had been an amazing day and one I will not be forgetting in a hurry. As we had all of us together we had brought a few beers along to enjoy at the end of the day and Sam popped his camera on John Friendship-Taylor's tripod for a group photo. 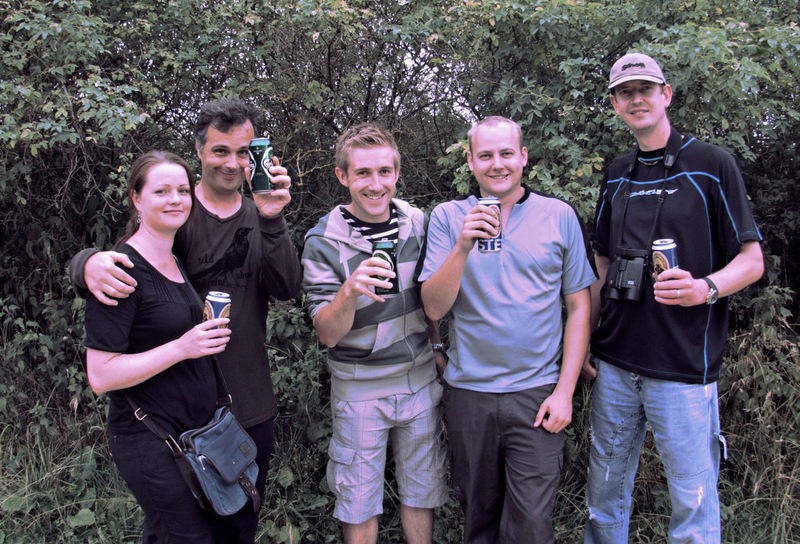 The beers turned into a toast to the Brown Hairstreak for capping the day of very nicely indeed! What a day!! From the left, Kirsty and Jon Philpot, John Friendship-Taylor, Sam Candy and me David James.